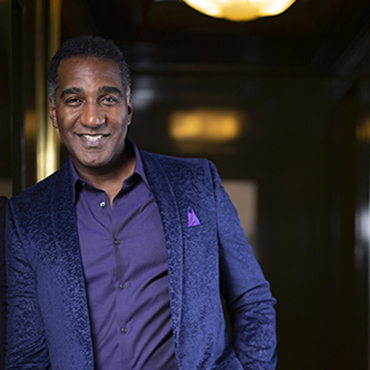 NORM LEWIS was recently seen in the NBC television special, “Jesus Christ Superstar Live in Concert!,” alongside John Legend, Sara Bareilles, and Alice Cooper. He recently appeared in the Broadway revival of Once on This Island and as Sweeney Todd in the Off-Broadway production of Sweeney Todd: The Demon Barber of Fleet Street at the Barrow Street Theatre, receiving the AUDELCO Award for his performance. In May of 2014, he made history as The Phantom of the Opera’s first African American Phantom on Broadway. He has been seen on PBS in the Live From Lincoln Center productions ofShowboat with Vanessa Williams, Norm Lewis: Who Am I?, and New Year’s Eve: A Gershwin Celebration with Diane Reeves, as well as American Voices with Renée Fleming and the PBS Special First You Dream – The Music of Kander & Ebb. He can be seen recurring in the VH1 series, Daytime Divas, also alongside Vanessa Williams. His additional television credits include Chicago Med, Gotham, The Blacklist, and Blue Bloods, as well as in his recurring role as Senator Edison Davis on the hit drama Scandal. Mr. Lewis received Tony, Drama Desk, Drama League, and Outer Critics Circle award nominations for his performance as Porgy in the Broadway production ofThe Gershwins’ Porgy & Bess. Other Broadway credits include Sondheim on Sondheim, The Little Mermaid, Les Misérables, Chicago, Amour, The Wild Party, Side Show, Miss Saigon, and The Who’s Tommy. In London’s West End he has appeared as Javert in Les Misérables and Les Misérables: The 25th Anniversary Concert, which aired on PBS. Off-Broadway Mr. Lewis has performed in Dessa Rose (Drama Desk nomination, AUDELCO Award), Shakespeare in the Park’s The Tempest, The Two Gentlemen of Verona (Drama League nomination), Captains Courageous, and A New Brain. His regional credits include Porgy in The Gershwins’ Porgy and Bess (A.R.T. ), Ragtime, Dreamgirls (with Jennifer Holliday), First You Dream, Sweeney Todd, and The Fantasticks.